Following their superb collaboration “Space Train” on Eastside Records, Makoto and A- Sides are back with a massive atmospheric jam. Live drums played by A-Sides roll on top of a super heavy bass line and some beautiful chords from Makoto. A must buy for fans of either the Eastside or Human Elements sound ! 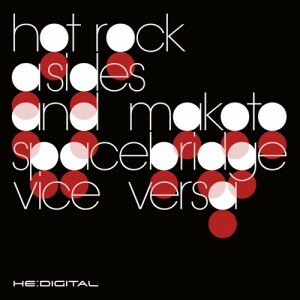 Australia’s finest musical drum’n’bass export Vice Versa make their debut appearance on HE:Digital with a spacey dancefloor track. Their trademark atmospheric, filtered synths float over super sharp rolling beats and a deep, driving heavy bass line designed to carry you off into another galaxy. HE:Digital第三弾シングルはドラムンベースシーンの老舗Eastside Recordsを主催するA- SidesとMakotoとのコラボレーション。2008年にInnergoundよりリリースされたMarky, Makoto A-SidesのToniteは多くのDJにサポートを受け、そのサウンドクォリ ティは実証済み。今回の”Hot Rock”はMakotoのメロディアスなキーボードにA-Sidesの ダビーなグルーブが絡み、古き良き時代をも感じさせるこの一曲は、ドラムンベースリス ナーに限らず全ての音楽ファンに聞いてもらいたい良質ダンスミュージック!!! オーストラリア発のドラムンベースユニットVice Versa。Good Looking Recordsでのリ リースを皮切りに、世界的アーティストDJ ZincやDJ Markyにその才能を見出され、Bingo BeatsやInnergroundからもリリースを続ける彼らのSpacebridgeは、スペーシー なシンセ音、疾走感溢れるドラムと共に、地を這うようにドライブするベースラインが印 象なフロアチューン。多くのDJ、アーティストよりサポートを受けている一曲が待望のリリース! !